Mumbai: Ambuja Cements Ltd, a part of the global conglomerate LafargeHolcim and one of the leading cement manufacturers in India, has celebrated the ‘Global Health and Safety Days 2018’, strongly reiterating its commitment to achieving ‘Zero Harm’ goal in all its operations. Having made great strides in the Health & Safety (H&S) journey since the first exercise held in 2016 as part of its parent company LafargeHolcim’s annual campaign, Ambuja Cement recently observed this initiative for the third consecutive year with great enthusiasm. A host of activities were organised for two weeks under the theme – ‘I improve health and safety every day in my workplace’ – which aimed at renewing the company’s focus as a learning organisation that places H&S as its foremost value and at the centre of all its operations. 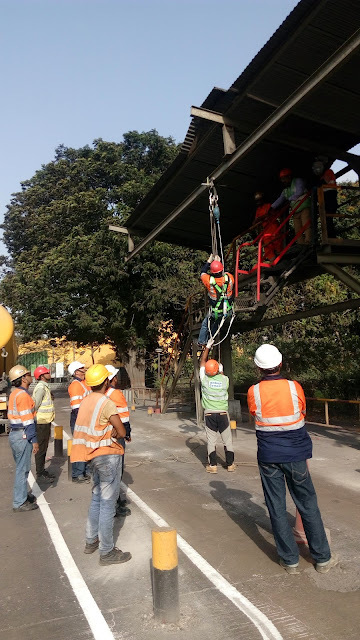 While plants focused on reviewing processes and key lessons learnt around the four main risks – mobile equipment and on-site traffic, energy isolation, working at height, and confined spaces – efforts were also made to ensure sensitisation on operational discipline and hazard identification. Similarly, offices saw activities around ergonomics, health management and much more. “We have a structured approach to drive our Health & Safety journey. This campaign has provided us yet another opportunity to touch all our stakeholders and keep the momentum going. The experience of this campaign is encouraging and giving us the confidence to achieve ‘Zero Harm’ at our operations,” concluded Mr Kapur. The activities educating and empowering thousands of stakeholders – employees, their families, third-party workers, transporters, drivers and vendors – were held at different locations across the country including Gujarat, Maharashtra, Himachal Pradesh, Rajasthan, West Bengal and Chhattisgarh. These activities included safety pillar talk sessions with thought-provoking slogans, ‘Shramdaan’ to improve housekeeping, operational discipline workshops, safety training and awareness sessions, personal protective equipment booths to raise awareness, road safety workshops and community engagement programmes among others. Since inception, Ambuja Cement has laid a strong emphasis on H&S parameters, which has enabled the company to retain its ‘Thought Leadership’ position in this space. While all its plants have been certified by the internationally recognised Occupational Health and Safety Assessment Series 18001 (officially known as OHSAS 18001), the company has over the years implemented various pioneering initiatives that stood out in the industry.